It’s that time of the year again – it’s Christmas time. The time of heating your ovens and cutting out cookies. The time of sweating over what presents to give to each and every relative. 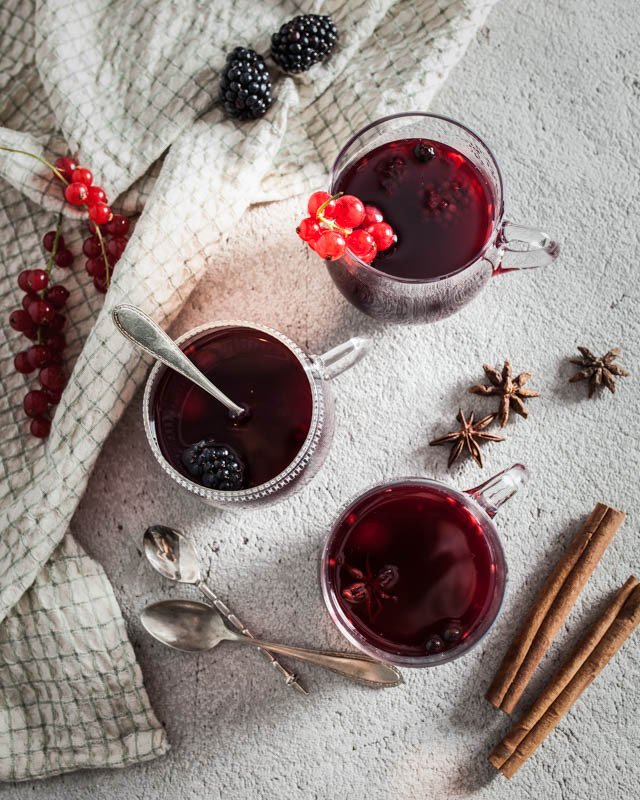 The time of cramping into the subway and fighting your way through the stuffed city centers and buying overpriced wood decoration while sipping on lew mulled wine. It’s Christmas market time all over Germany and Europe!!!! Wild horses couldn’t possibly drag me to one of those Christmas markets anymore – thank you very much. It’s not only the unbelievable lust for consuming ridiculous amounts of money for stupid, useless things, or the watery, overprized hot drinks or even the oh-so-crazy office clerks getting wasted with flashing Christmas hats or reindeer antlers on their heads celebrating their highlight of the year – the Christmas staff party! – that trigger a nervous twitch on my face. It starts with me feeling more than uncomfortable and getting downright aggressive when walking behind waaaay too slowly trotting masses of people. Christmas markets are the place where all those people that I try to avoid the whole year gather up. That type of person that stops directly after stepping from the escalator to ponder about whether to look for a nice polar bear sweater or to start at the fifth floor finding a cashmere cardigan for aunt Clara. 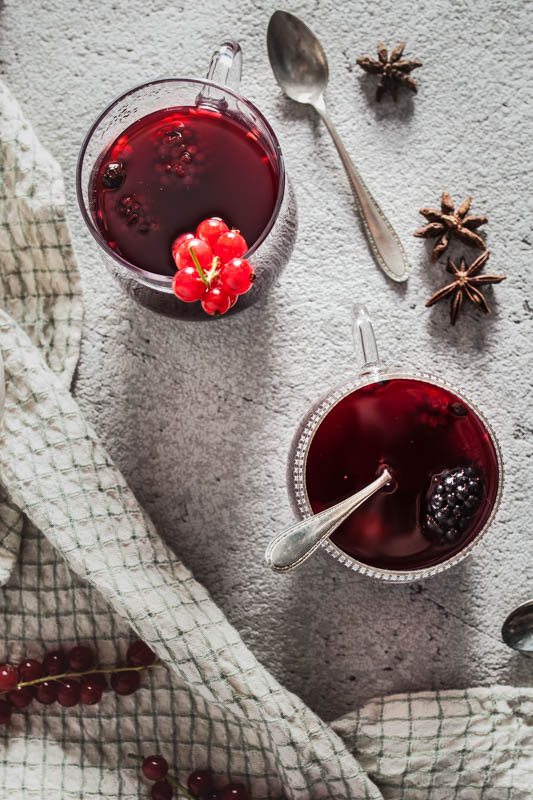 You can make this hot winter punch both ways – with and without fun uhm… alcohol – and it’s a very nice base to start experimenting with your favourite fruits and juices. Wether you add apples or pears (you could even compare them this way!!) or pour a whole bottle of red wine in it – just don’t give a f*** and do whatever you like. I’d still recommend to stick to some Christmassy spices, in this case cinnamon and star anise. And of course you can always add more sweetener of choice. Take the frozen berries out and let them thaw while preparing the rest. Add the juice, cinnamon quill, star anise and orange slices to a pot. Warm it up on medium heat. 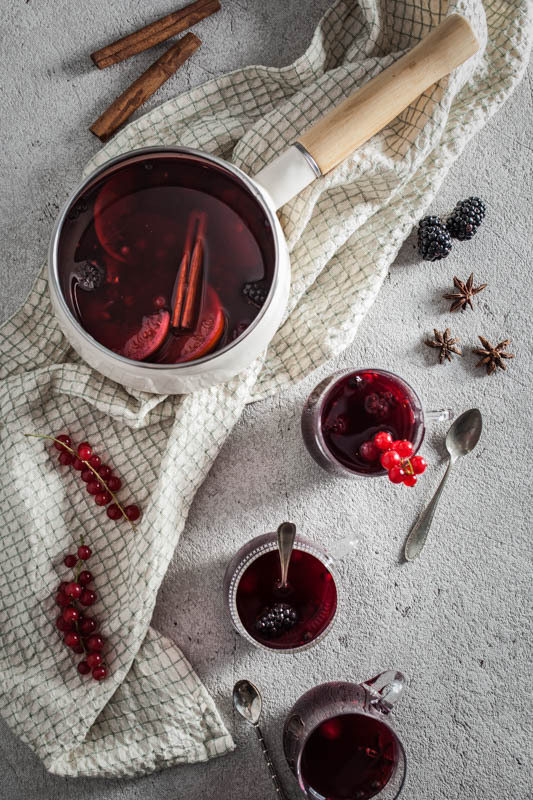 As soon as the liquid is hot you can add the frozen berries and they'll warm up in no time. 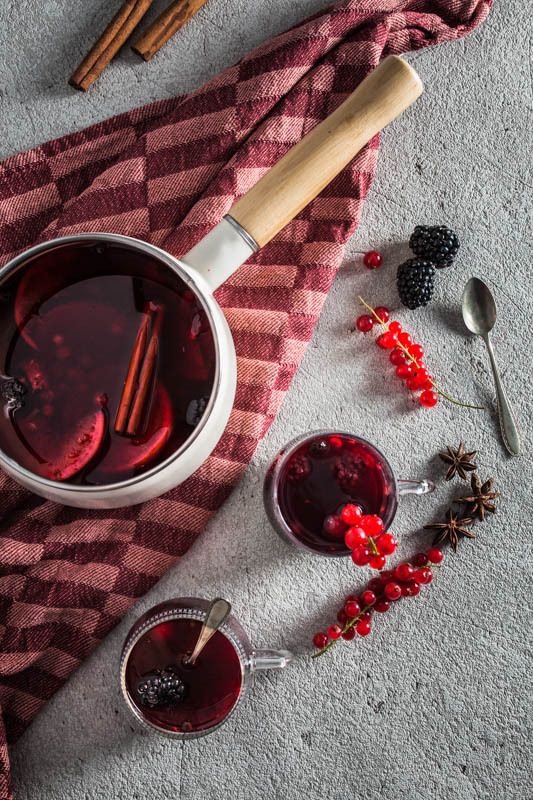 Be careful to not boil the punch, especially when you've added alcohol. You just want to warm it up nicely. Make sure to taste it now and then and adjust it to your liking e.g. by adding some sweetener or more cinnamon. 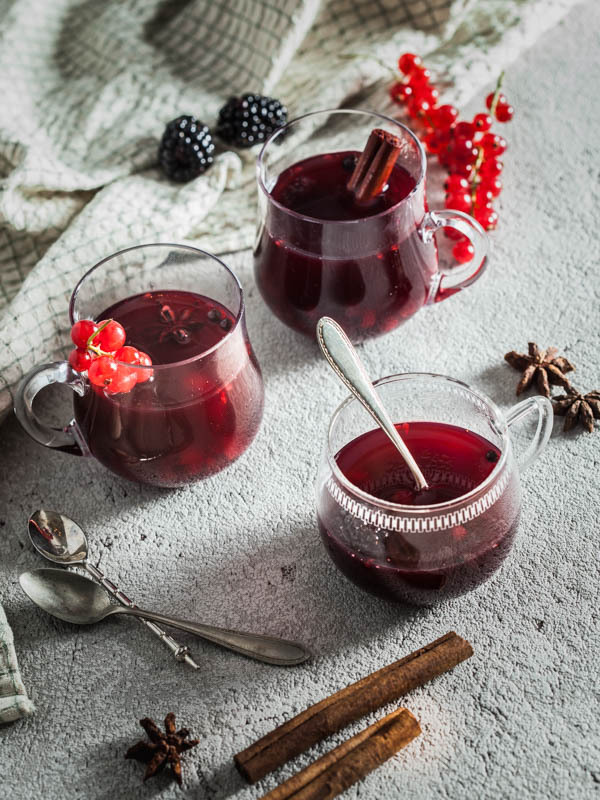 Serve the hot punch in cups or tea glasses and add a spoon for the berries.